bestia.io | Grow monitors | What watches the watchers? 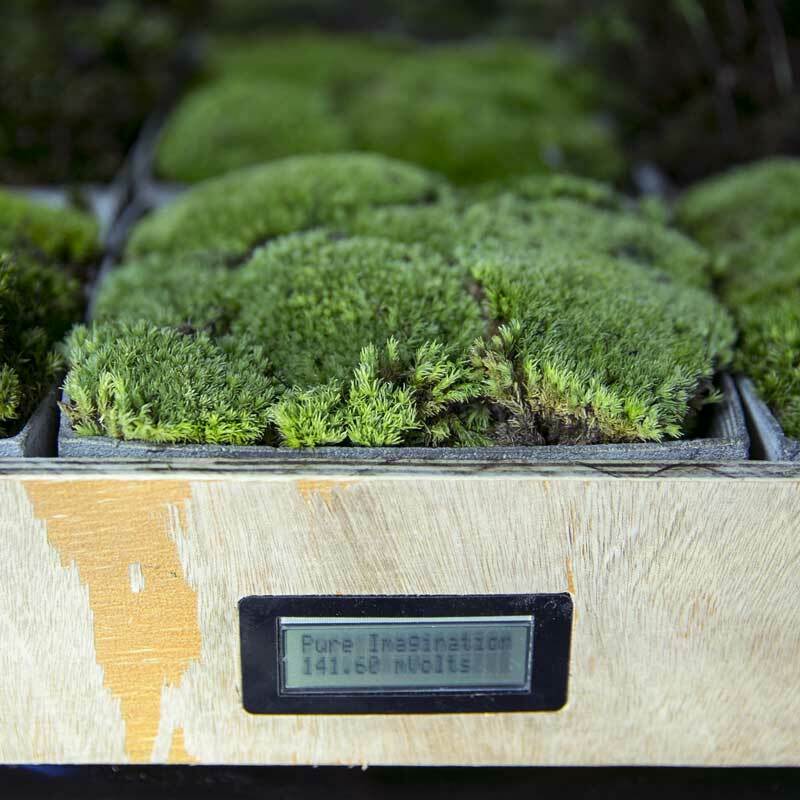 Simultaneous to the module development, I will produce some grow module monitoring equipment. Previously, I worked with a phototransistor sensor, an LCD output and wrote a basic graphical interface for live monitoring the phototransistor readings. Today, my goal is to combine these with voltage sensoring so I can begin tracking the correlation between sunlight and power generation in the bioelectrochemical testing modules. 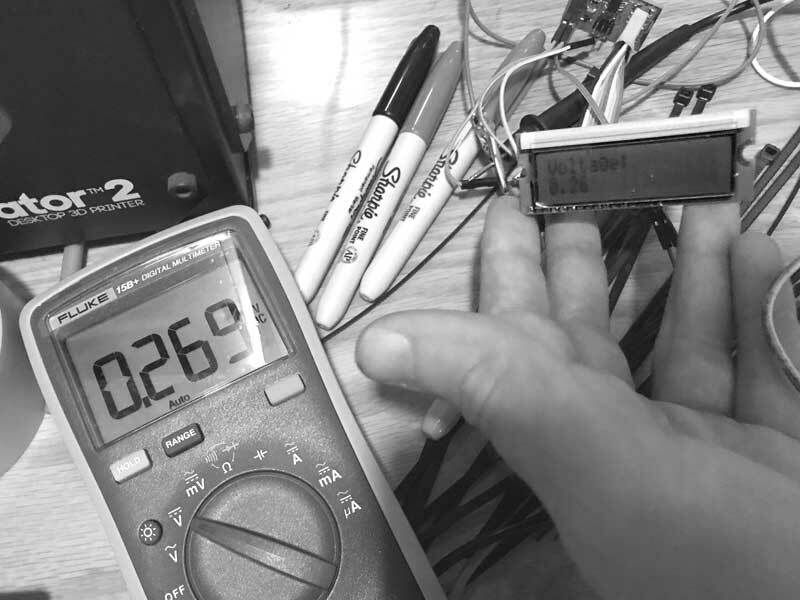 Starting with a little research, I found that by simply connecting an input voltage to an open ADC pin, I could take voltage readings. Duh. I have been doing this for weeks via the phototransistor. I returned to the LCD PCB I fabricated for an ATtiny 44 with an LED. The LED was connected to ADC7 of the ATtiny 44. Great news because I can quickly modify this board for testing voltage. I never soldered the LED to the board. Instead, I soldered female pins, which is quite convenient now. I replaced the 499 resistor with a 0 ohm resistor at the electronics bench. Then within Arduino IDE, I wrote this program. 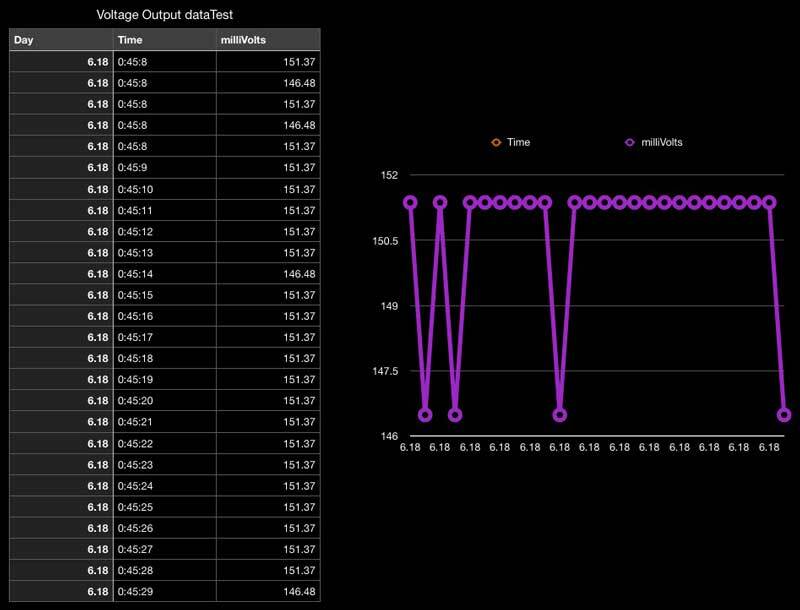 The floating number is necessary to get more precise readings, particularly with the small voltages coming from my current plant testing modules. The cathode of the power source connects directly to the ATtiny pin and the ground is common to the board. I tested program with this pair of rechargeable batteries which may come into play at a later point to store energy produced by the plants. As my father loves to proclaim before a critical test, moment of truth. I connected the board to the plants (wired in series) and another volt meter as control. I like it. I started working on checking the controller's internal volt reference but when I decided I would like to evolve to the ATmega, I set it aside and have not had a chance to resume yet. Because the readings from the controller are relative to the voltage coming in, and voltage can vary slightly from source to source, this is a way to calibrate analogue readings. As usual, it is in the datasheets. Next, I went to work on a way to visualize and permanently log data from sensors with Processing. Much more detail on this can be found in my previous post on applications. First the Arduino code. And the processing side is an evolution of my previous work. The biggest additions are corrections to the processing and arduino communication via serial, now Arduino properly awaits queries from processing, and Processing writes the data it receives with a time stamp to a text file in a format that can be simply copied and pasted into a spreadsheet application. And this is a test outputting to a spreadsheet. This is macOS numbers, which uses tabs to differentiate cell data. With some bits of code working and my ATtiny44 board maximized, I decided I would like a board that can output to serial and LCD, plus take readings from multiple module combinations or individuals and a variety of environmental sensors I found in the lab. That in mind, I thought I could upgrade to an ATmega board... for the first time in the Fab Academy cycle. Like many others, I started by studying then modifying Daniele Ingrassia's SatschaKit. 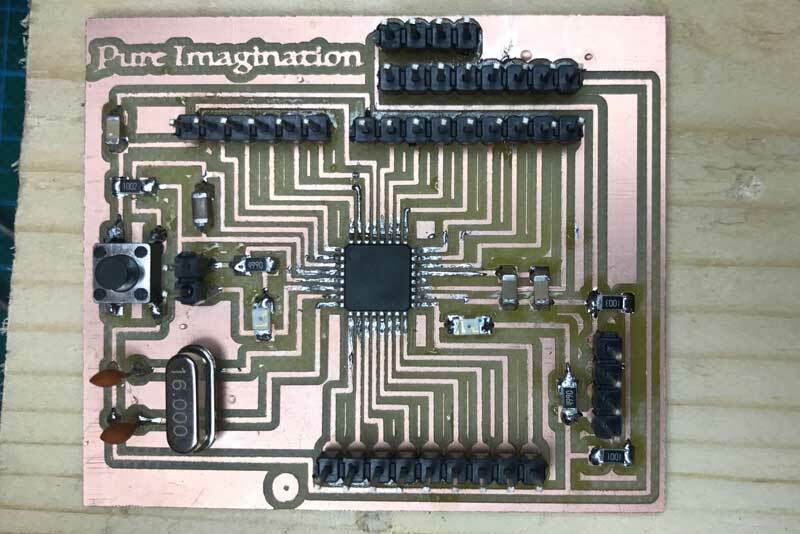 I added many pins to be used for attaching breakout boards for environmental sensors and voltage readings plus resistors and additional pins for an LCD. After I fabricated it, I realized I should have added a regulator for voltage in from non-computer sources. I will do that and more in the next iteration. In the meantime, I sourced an INA219 High-Side Current Monitor which work with I2C for current and voltage measurements. Plus I found this example uses Arduino IDE and ATMega I2C with an INA219 and an LCD output and by extension below, battery recharging management. Soldering the ATmega is tough, especially if you do not have a sharp point on your soldering iron, like me. 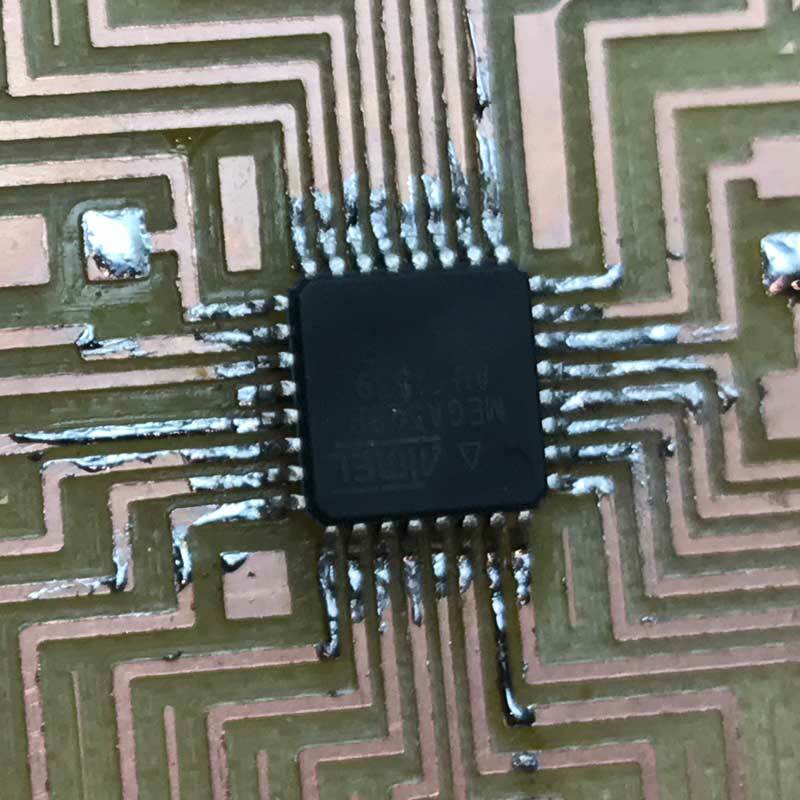 Instead, I applied small bits of solder to all the traces around the ATmega, carefully positioned it with the hot-air blower then slowly reflowed all the connections and added solder when needed. Jury is still out on whether that was effective, because I do not have the board running smoothly yet. 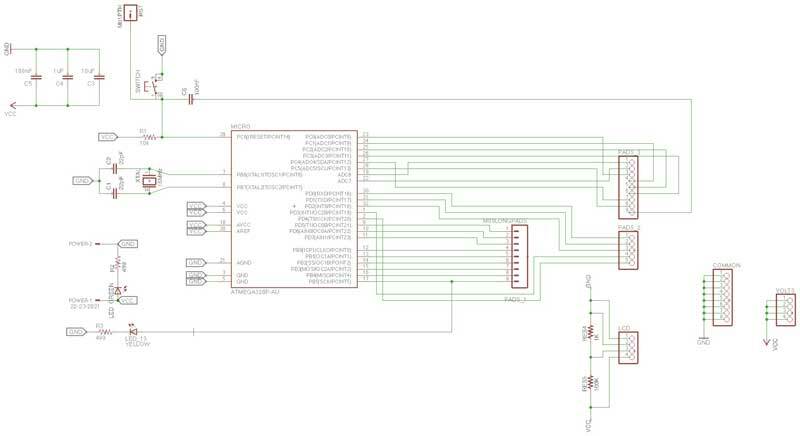 The next step is to upload the Arduino bootloader for an Arduino Uno to the controller. This can be done with a programmer or even another Arduino. I used a programmer as per the SatschaKit github. I was having all kinds of problems with it though. 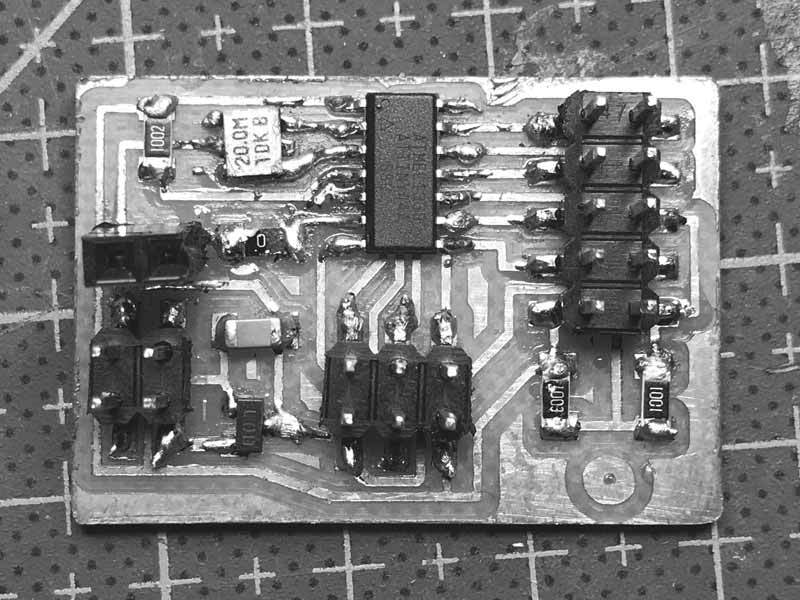 First, I found the pads around the 16mHz resonator are small and were not making good contact. I did a bad job. The, I needed to update the Arduino Uno board manager. Next, I found fabISPs in the lab, mine and others', were having a tough time consistently uploading sketches. Sometimes the uploading process would simply stall. 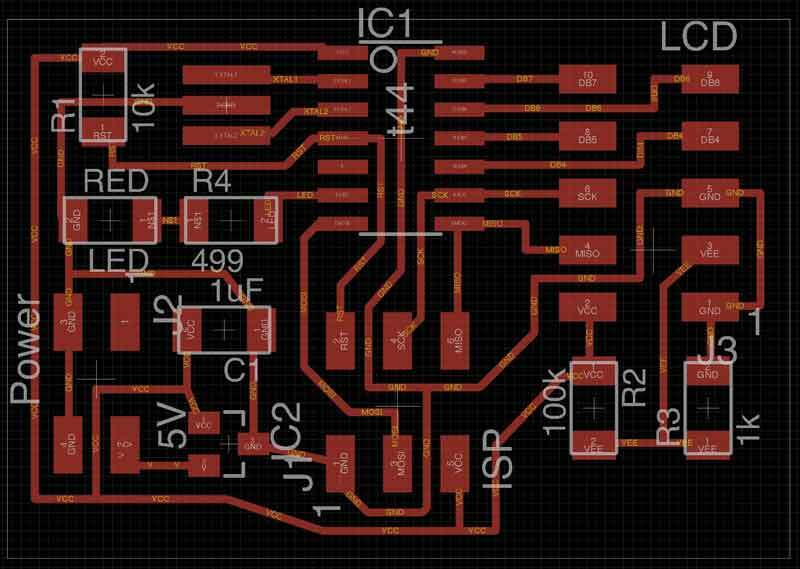 After much consternation, I was able to get the bootloader then blink example uploaded to the board via a fabISP. However, I still am unable to upload sketches directly through an FTDI. I get a message about programmer not responding and then it tries again for 10 times. And, the fabISP is miss far more than make now for uploading. Takeaways : And that brings me to now, a couple hours before the final blog updates for the session. I tried to spiral up to a more robust data logging controller but fell a little short. 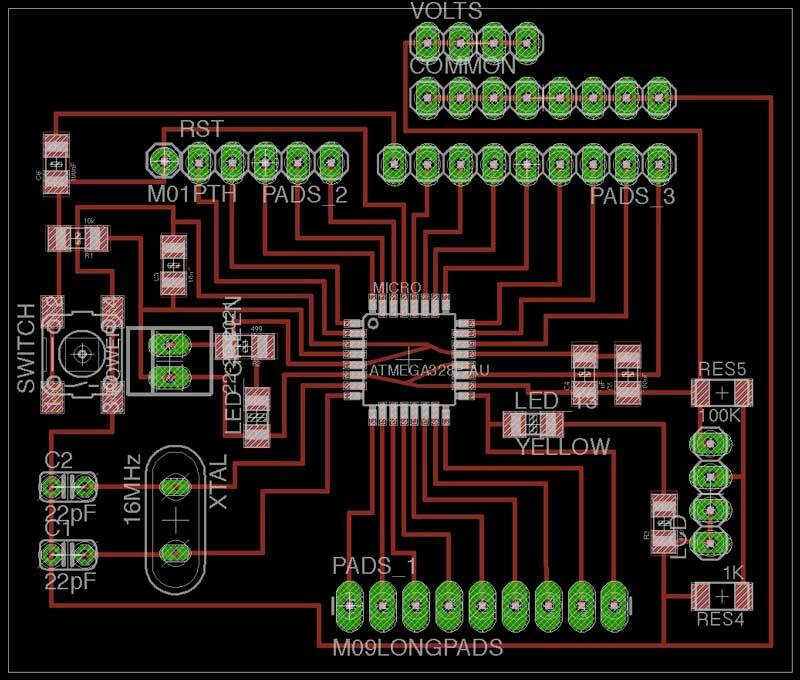 I will continue to debug this board design and fabrication until it works. I hope having more data helps me to optimize this particular setup of microbial fuel cell, share with other researchers, and develop more efficient systems of electricity generation. And, I do not like the wood frame at all. I will change that in the next iteration after the electronics are improved. 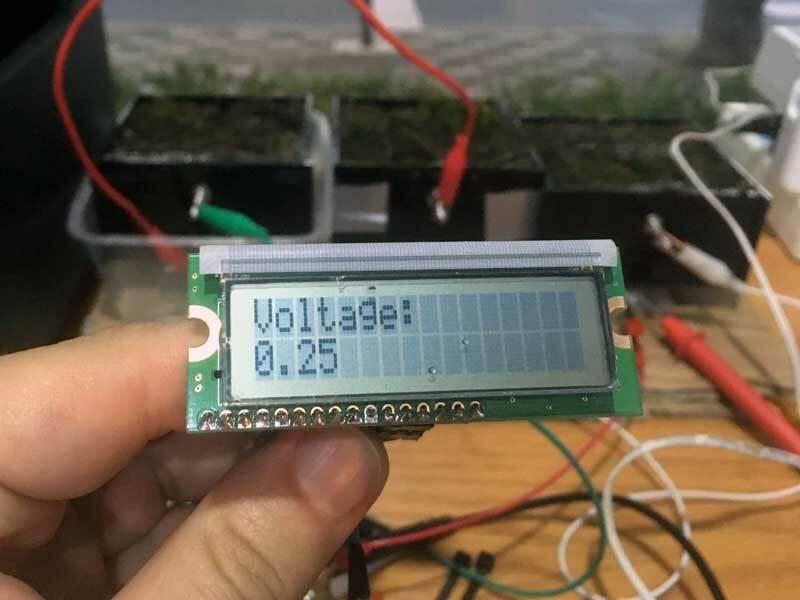 Digital Arduino Voltmeter : Voltage readings in, LCD output example. Analog to Digital Conversion : Top up your knowledge. Lithium Ion battery charge circuit : Ben Heck is so cool. Arduino current monitor : Arduino IDE and ATMega with an INA219 High-Side Current Monitor with an LCD output. 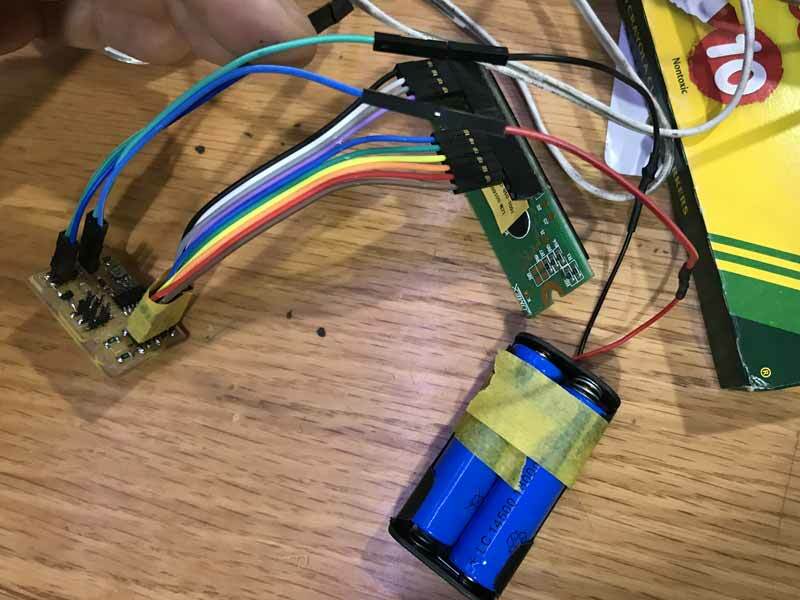 How to make an Arduino Battery Charger : this setup charges an NiMh battery with an INA219 current monitor and OLED output (extension of setup posted above).